From Jan 2014 through Nov 2017, we estimate there have been 437 blockchain projects that have raised at least $100k via token sales. For more on our deep dive into the Ethereum and Bitcoin blockchains, check out our last post, where we size the ICO market at about $6.4 billion being raised to date. 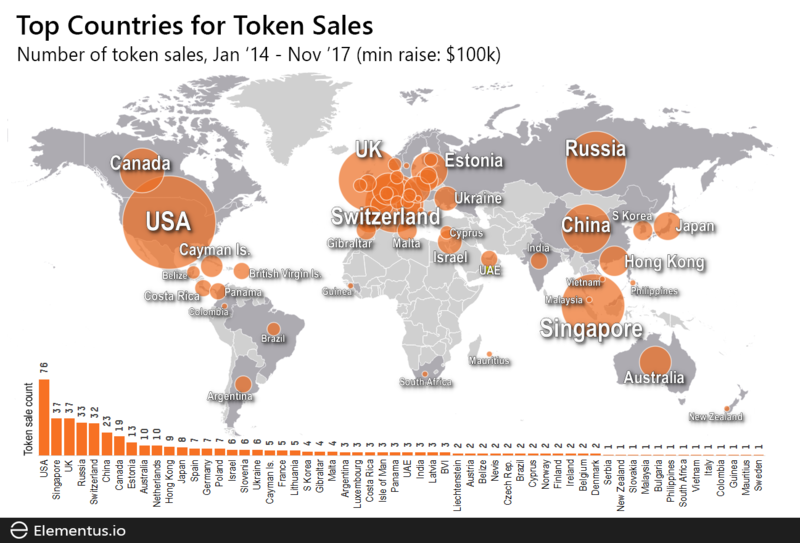 There have been blockchain projects from nearly 60 countries which have raised at least $100k via token sales. More than a third of those projects are tied to three countries – USA, Singapore, and the UK. Three quarters of said ICOs link back to 15 countries, i.e. there is a long tail of countries from which each has fewer than 6 projects. Europe comprises this long tail of ICO activity. 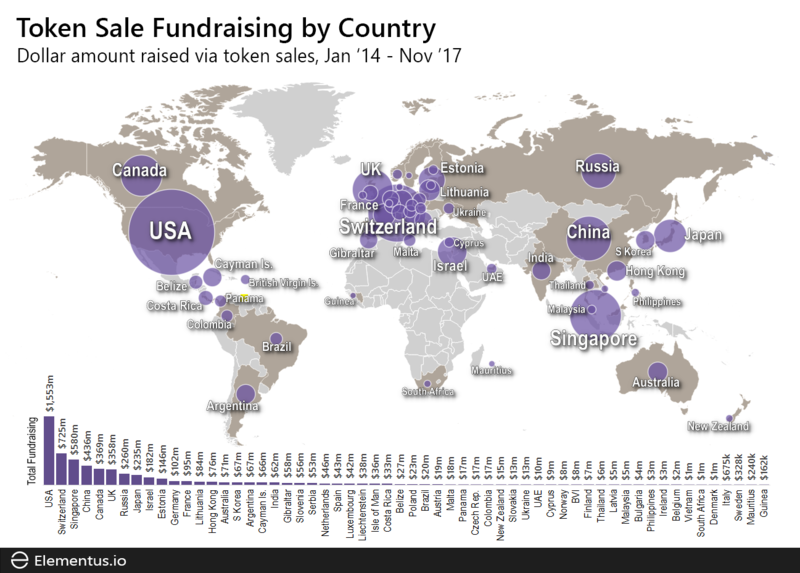 Elementus has identified 20+ countries where there have been 5 or fewer token sales raising at least $100k. 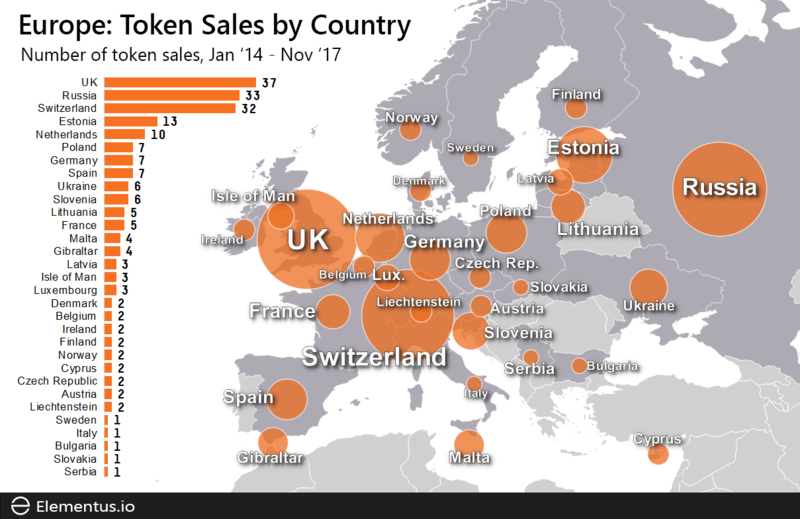 The UK, Russia, and Switzerland represent nearly 50% of European token sales (by count). More than $6.2 billion has been raised to date via token sales from non-Stateless/Unknown regions. Nearly 60% of that amount is linked to USA, Switzerland, Singapore, China, or Canada. These 5 countries also have the largest average amounts raised per ICO, when focusing on countries where at least 10 token sales have taken place. The UK, Russia, Australia, and the Netherlands combined have an average amount raised of just over $8M per token sale vs. nearly $20M average per token sale from the 5 countries above. 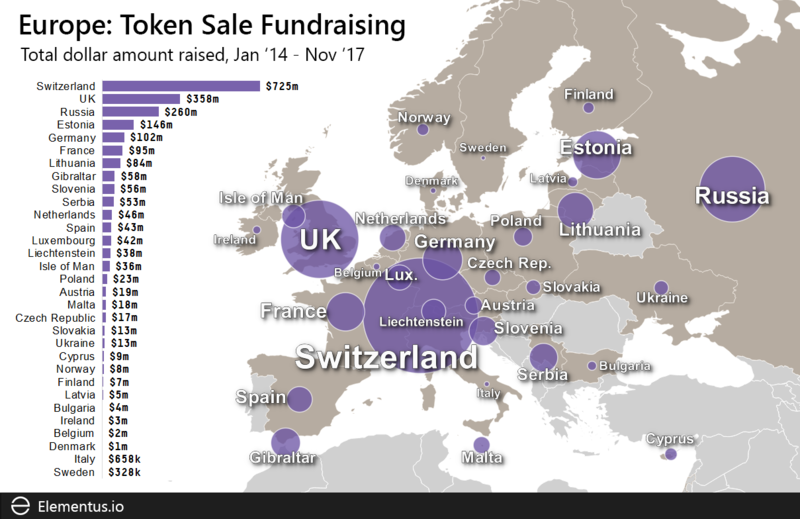 About 60% of funds raised via token sales from European countries are tied to three countries – Switzerland, the UK, and Russia. Over $500 million has been raised from countries that comprise the long tail described earlier (where 5 or fewer token sales raising more than $100k have taken place). Is our data perfect? Absolutely not. We are confident that Elementus has the most comprehensive/accurate ICO data set out there, but we’re not perfect. Please be in touch if you suspect we’re missing something or utilizing inaccurate data! In the coming weeks, we will be posting more data-driven insight into the token sale market. If you liked this post, sign up below to receive the next one in your inbox. Our technology surfaces actionable insights directly from blockchain activity, identifying security vulnerabilities, exposing bad actors, and providing market intelligence for making informed investments in digital assets.